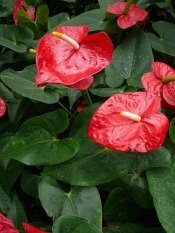 Anthurium plant is among the best-known tropical flowers. Popular in tropical flower arrangements, Anthurium bouquets are often used in weddings on Hawaii and other Pacific islands. Anthurium plant, also known as tail flower, is especially colorful from spring through fall. 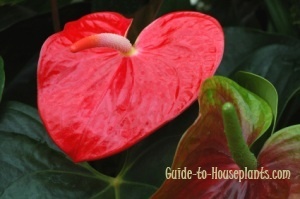 Anthurium flowers are long-lasting, and newer cultivars will bloom almost year-round. The glossy red, heart-shaped flowers are actually spathes that last for several weeks, each with a white spadix covered densely with its tiny, true flowers. Some varieties have spathe colors that are pink, orange or white. Long, dark-green leathery leaves are held on upright stems. 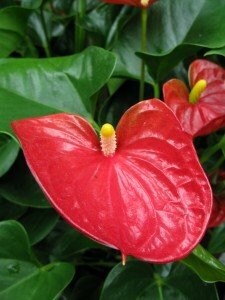 Anthurium leaves are poisonous. They contain calcium oxalate crystals that cause severe burning in the mouth. Keep the plant away from pets who may play with or chew on its foliage. It's also a good idea to wear gloves when handling this plant to avoid skin irritation. Shed some light. Bright light will make these beauties bloom. Give your plant as much bright light as you can year-round, but keep it out of direct sun. A curtain-filtered sunny window is ideal. Raise the humidity. Because of the need for humidity, Anthurium growing can be challenging in the home. However, newer cultivars are less fussy than the species. If the relative humidity drops below 50%, use a humidity tray or room humidifier to increase the moisture in the air. Grouping plants also helps to maintain the humidity around them. Brown leaf tips may be a sign of dry air. To repot...or not. The best time to repot your Anthurium plant is when new growth begins in spring. Move into a pot that's only 1 size bigger -- and only when necessary. Set the plant high so that the crown sits above the soil line. If roots show up at the surface between repottings, cover them with potting mix. Use a pot with drainage holes to prevent soggy soil. Keep it clean. Anthurium leaves are naturally glossy. Just wipe them with a damp cloth to keep them dust-free. Avoid leaving water drops on the leaves because it may cause brown spots, a fungus that needs to be treated with a fungicide. Height: Up to 18 in (45 cm); compact cultivars reach only 12 in (30 cm). Tall flower stems may need staking. Light: At least 4 hours of bright light each day. No direct sun. Water: Keep soil evenly moist spring through fall, slightly drier in winter. Yellow leaves are often caused by overwatering. Water thoroughly, but don't allow soil to get soggy. Humidity: Try to maintain 50% relative humidity or higher. Here are some easy ways to increase humidity for your tropical houseplants. Temperature: 65-70°F/18-21°C at night, 75-80°F/24-27°C during the day. Fertilizer: Feed every 2 weeks in spring and summer with a high-phosphorus liquid fertilizer diluted by half. Propagation: Divide crowded clumps when repotting. Plant separately in small containers. New plants should bloom in about a year.